A major component to any efficient piping system is an equally efficient fitting system. 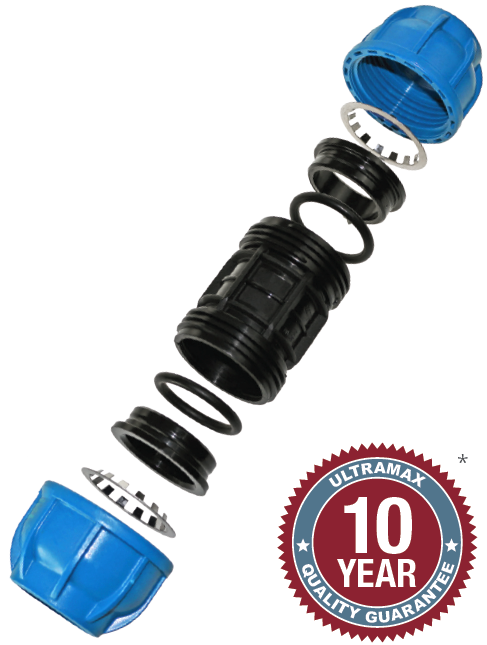 Ultramax Sicoair makes use of one of the best in the form of our 100% leaktight compression fittings. Designed with quality in mind our fittings are manufactured from Akulon Polyamide, one of the most highly used industrial grade plastics, renowned for its robust strength, high detail finish, cost effectiveness and long service life. Our fittings make use of a series of grip rings, seals and o-rings to ensuring said leak tight join. Key to this process is the stainless steel grip ring, and the manner in which the teeth bind into the aluminium to hold the tube inside the coupling, whilst an internal nitrile o-ring gasket ensures that the joint is truely leak tight, and remains perfectly sealed even in the harshest conditions. Combining the superb range of features of Akulon with a tested and proven leak-free design and a 10 year guarantee*, Ultramax Sicoair Fittings are an ideal fit for a host of piping solutions.